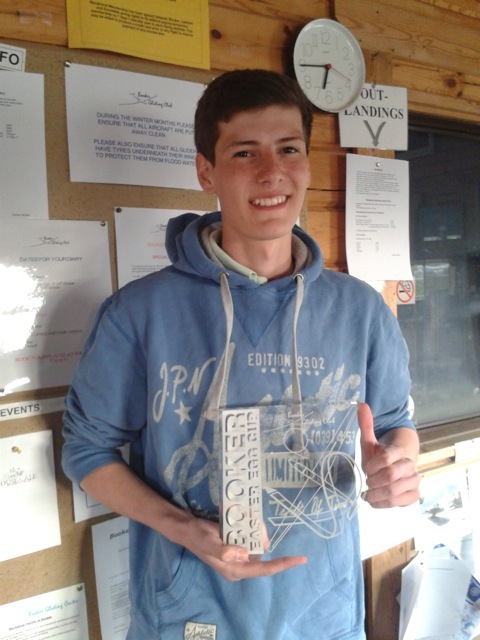 Congratulations to Will Ellis, competing in the Club Class nationals at Lasham this week, who was joint winner of Day 3 yesterday. Snickety - Snick - Jackpot! What a cracking afternoons flying - in fact it's been an amazing day all round - I have officially had my cake and eaten it. It all started inauspiciously with some uncharacteristically rubbish weather for the silver course: We've had an amazing season so far, so I've got no idea why the weather blew such a large raspberry last week. Weekends are sacrosanct - but by pulling a long enough hound dog expression, I had a ticket to a couple of hours flying one afternoon. I needed to pick - and I picked Sunday. Saturday arrived, with cotton wool clouds to the horizon: 750km flights on the BGA ladder. Blast. I may have picked wrong. Sunday dawned beautiful, clear and crisp. And by noon - it remained blue. Hmm - it might be a bit of a challenge to stay up in the blue - maybe we should have a long lunch instead? So I as I sat enjoying an impromptu family picnic in the park. There was laughter, fun, great food, great company - and frankly flying was forgotten. As I headed out of London at 3:30pm, I could see to the north west the unmistakable signs of VERY high fluffy clouds. Cor blimey - this might just work out! 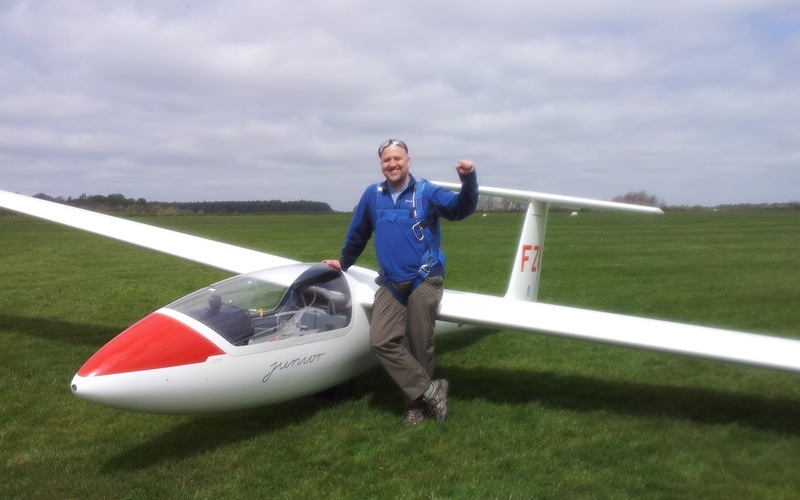 As I turned up at the airfield at nearly 4pm, I was staggered to find some gliders available to fly. Even better, Rob was helping out, and Rob is a lucky talisman par extraordinaire; ALL of my long flights have been when Rob is on hand. 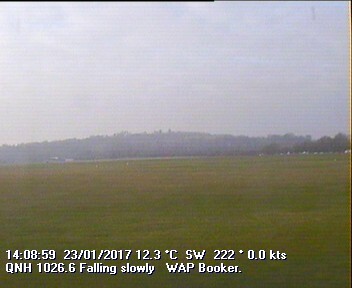 I had a quick check flight before my first attempt in the junior: Off we popped at 1000ft for a quick circuit, and blow me if there wasn't lift everywhere! In fact we needed the brakes to come down! I stepped straight out of the K21 and into the Junior. I was duly briefed and dispatched with my ears full of PIO. But the take off was easy-peasy! I had hit the jackpot. 2 hours and 25 minutes later - we touched down. I must have spent most of the those 2 hours well above 3000 ft. And every cloud I pointed to, just worked. This has never happened before! Thanks a million to Symeon and Rob - there was some confusion about the time I needed to land by. But rather than send a surface to air missile to bring me down, they actually collected me from the runway! It just goes to show you can never predict when you'll have your best flights - and it's always worth turning up at the airfield just to 'give it a go'. I am going to finish this day with a cold beer. Finally summer seems to have arrived - although it was very cold on Saturday despite the sun. However, the cold made for excellent cross country conditions. Most people whizzed round the club task yesterday, and Denis took his starship to Ludlow and back. Today there was more of the same for the shiny fibreglass, while at Booker Graham was practising aeros in his yellow Lunak and Rob brought out his beautifully refurbished Javelot for its first flight in its new livery. Ruth Jackson was over the moon with her first solo flight today, which included some soaring and, according to her instructor 'a very nice circuit and landing'. The grin says it all! Plenty of flying over the last few days which started with the need for sunscreen and then keeping an eye on the showers coming through - all of which gave many of you a chance for some good soaring. 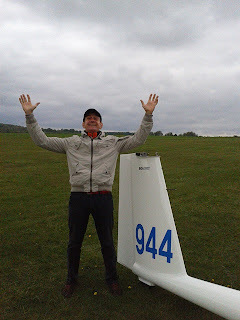 Back at grass roots, training is continuing and it was a very happy Boris who went solo today in a K13 for the first time. Not content with one solo flight, he went on to fly a further 3 solos and is already considering his next steps. It is refreshing to see such enthusiasm and we are sure to see him at the launch point a great deal over the coming weeks. As always, congratulations on his solo achievement - who will be next? Following in the tradition of holding the Easter Egg Cup some time after Easter, the report of the results is also late, having detoured through an internet black hole. The weather on Saturday morning was not ideal, which may have discouraged some entrants, but it calmed down nicely after lunch and in the event there were seven competitors who all produced very creditable performances, all with scores over 70%. The winner with an impressive 85% was cadet Ben Followell, followed by Robert Turner with 82.77% and Chris Collett with 80%. Hakan Gokal was delighted today when he took the next step up the club fleet taking his first flight in the Junior. 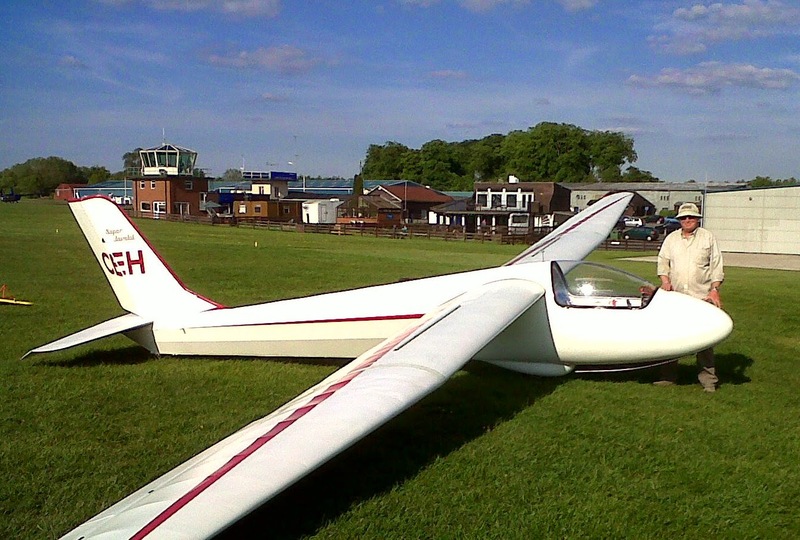 Guy Trees demonstrated his party trick of getting a Super Cub to disappear inside his head. Guy then demonstrated a superb aerobatic sequence. Here is a taster, about half of the sequence starting with a "perfect 10" stall turn, and that is not in slow motion. Time permitting the Hi Def version, taken from three camera angles, will be on YouTube soon. this time without the engine! I did a Snowdon out and return about ten years ago, but had to use the engine on the way back. I was determined to do it without the engine. I launched at 11.15 but when I got to the Cotswolds it was 8/8s and I nearly turned around and came home. For some reason I hung around between Moreton in Marsh and Edgehill for an hour and a half. Gradually the gloom began to break up and I pushed on, crossing the Severn at 13.30. Conditions improved all the way with 5 or 6 knot climbs for a while. I turned Snowdon at 15.40 and had a steady run back, slowing down as conditions weakened. The last climb was at Kiddlington and that put me on a squeeky final glide, landing at 19.30. A very pleasant day out.